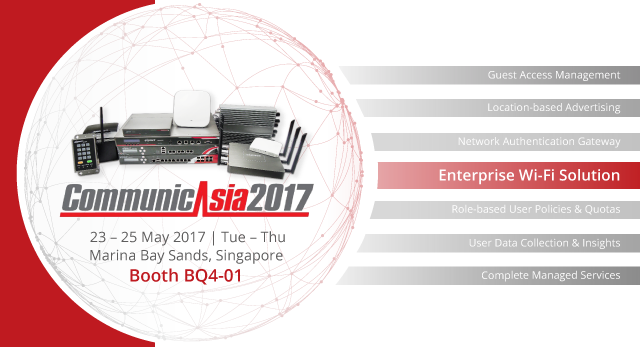 4ipnet will be exhibiting its enterprise Wi-Fi connectivity, access control, and hotspot solution at CommunicAsia 2017. It is our pleasure to invite you to visit our booth, BQ4-01 in Hall F, between May 23-25. During the show, we will be showcasing our newest 11ac products and solution features, including social media login, location-based marketing, and integration with popular hospitality platforms such as TripAdvisor. We look forward to meeting with you to discuss your requirements, and how we can provide the best turnkey wireless solution for your customers. If you would like to unsubscribe, please click here .